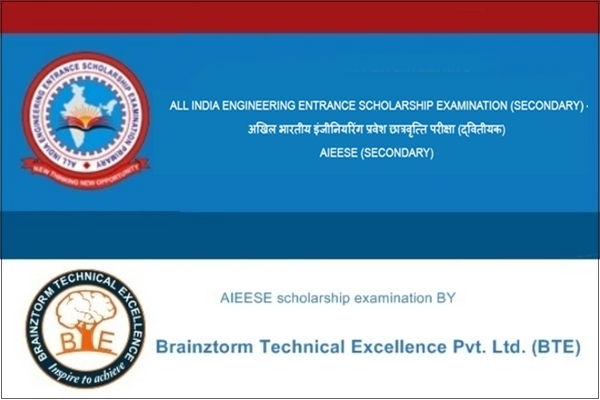 Brainztorm conducts AIEESE (Primary) scholarship examination every year for engineering aspirants on national level to grant scholarship and help them admit to the choicest institute. This is one of the most desired examinations after JEE (Main) and JEE (Advanced) for all those students, who have chosen engineering as their career and wish to pursue it from any of the IIT or NIT. All IIT/NIT aspirants must also apply for AIEESE (Secondary) to qualify it for scholarship as it plays a supporting role in pursuing their education on being successful in JEE (Main) and JEE(Advanced). We grant scholarship in terms of financial assistance so that even those candidates who have come from weak financial background could not face any problem in pursuing engineering courses in any of IIT/NIT across the nation. To inspire and encourage the deserving and meritorious students, BTE is conducting the All India Engineering Entrance Scholarship Examination (Secondary) to grant them scholarship for pursuing education in IIT/NIT. The initiative of the national level merit scholarship scheme is to provide financial assistance to meritorious and deserving candidates, who are unable to get their dream institute on their own. Such students don't have to worry now as they can now feel assured of realizing their dream by participating in AIEESE (Secondary) examination, which will help them in getting full tuition fees for studying in any Engineering Course in any of the IIT or NIT across the country. The scholarships will be awarded as a tuition fee (up to full four years tuition fees) for each year of the student's under graduate studies and will be awarded on the basis of merit. The at least scholarship for all qualified students is a “Standard Laptop” which will be provided just after completion of process of admission in AIEESE (Primary) participating institutes. The academic criteria for appearing in AIEESE (Secondary) are that the candidate must have passed the final examination of 10+2 (Class- XII) or its equivalent referred to as the qualifying examination with 60 % marks in all subject. Those appearing in 10+2 or equivalent examination may also appear at AIEESE (Secondary) provisionally. Candidates whose date of birth falls on or after 1st Oct. 1994 are eligible to apply for AIEESE (Secondary) . However, in the case of Scheduled Caste (SC), Scheduled Tribe (ST) and Physically Handicapped (PH) candidates, upper age limit is relaxed by 5 years, i.e. SC, ST and PH candidates who are born on or after October 01, 1989 are also eligible. The date of birth as recorded in the Secondary Education Board/University certificate shall only be considered valid. The students will be selected based on the performance in Scholarship Test The entrance examination will be conducted offline(Pen and Paper based) only, consisting of three sections namely Physics, Chemistry, Mathematics or Biology bearing equal weight age in terms of questions and marks. There shall be objective type questions. The candidates shall not be permitted to take the exam if admit card and valid photo identification is not presented. It may be noted that you should have specified one of the following IDs: Driving License, Passport, PAN Card, Voter ID, Aadhaar UID or School / College ID Card.